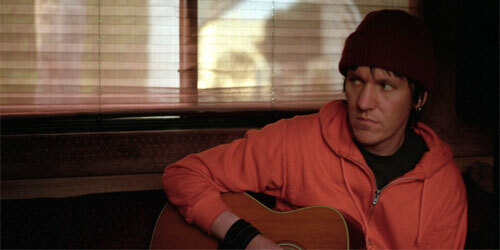 Heaven Adores You is the film Elliott Smith super fans have been anticipating and dreading for 11 years. The first feature-length documentary released about Smith, the film made its New York debut last week at the DOCNYC festival. You’ll find the first few paragraphs of my review below and the entire review at Next Projection. Given my very close relationship to this material, this was one of the more personal reviews I’ve ever written. The film disappointed, but I’m happy it exists. For a long time, Elliott Smith was just another guy. He traipsed around Portland, his home of many years and the central location of Heaven Adores You, like any other face about town. He did drywall jobs to pay rent and played in a grunge band at small dive bars. He put out records that did OK in his own city. He was a regional darling, if that, within a thriving local scene. By 1998, Smith was doing interviews on “Total Request Live” and getting mentioned in the same sentence as Celine Dion. How did this happen? To chart his ascent from Portland secret to obsessively beloved singer/songwriter, we can point to two facts. The first: Smith had a superhuman talent for writing melancholic pop songs. The second: Smith lied about the song “Miss Misery” to make it eligible for an Oscar. Smith and director Gus Van Sant claimed he wrote the song for Good Will Hunting – thus qualifying it as a Best Original Song – when it was just another unreleased number he had lying around. That lie lead to an Oscar nomination, a record deal, world tours and a level of fame that left Smith with profound unease. “I’m the wrong kind of person to be really big and famous,” he says early in Heaven Adores You. The film, now playing at DOCNYC, strives to both celebrate Smith’s music and prove this essential point. Smith entered the world of celebrity on a lie, and his very presence there was a mistake. Heaven Adores You, despite its rather strange collection of shortcomings, makes do as a primer on Smith and the impact his music has on people. It’s a respectful if far too safe first cinematic draft of the Elliott Smith story.